Sat, Sep 8, 2018, 08:50 am SL Time, ColomboPage News Desk, Sri Lanka. Sept 08, Colombo: India has agreed to supply 160 railway passenger coaches to Sri Lanka valued at around US$ 82.64 million under concessional financing. 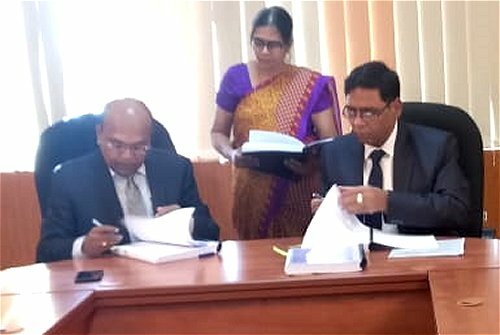 The contract agreement to supply 160 passenger coaches custom-made in India to suit the requirements of Sri Lanka Railways was signed between RITES Limited of India and Government of Sri Lanka in Colombo on 7 September 2018. Mukesh Rathore, Director (Technical), RITES Ltd. and G.S. Withanage, Secretary, Ministry of Transport & Civil Aviation of Sri Lanka signed the agreement. India has already completed projects close to US$ 1 billion under concessional financing in the railway sector in Sri Lanka. This project is in continuation of India's efforts to partner with Sri Lanka in people-oriented connectivity projects in Sri Lanka.